CCF Advisors is a unique independent comprehensive financial services company located in Rocky River Ohio. Our primary objective is to give our clients access to the most expansive markets available to today’s retail and business investor. Through our unbiased approach, we create and implement innovative solutions for our client’s individual financial needs then provide continued service to ensure we maintain our relationship over the long term. We welcome you to learn more about our firm and how we can guide you through today’s volatile markets. Our Free Consultation is designed to furnish individuals with a complimentary review of your current financial situation and make recommendations in situations where change would be advisable. Learn more about our Free Consultation here. Our Annual Fiduciary Review is a complimentary service designed to protect business owners by ensuring their plan is compliant. Sign up here for your complimentary Annual Fiduciary Review. 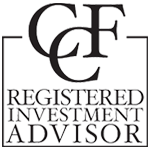 Investment Advisory Services offered through CCF Advisors, a Registered Investment Advisor. Registered Representative of and securities products offered through Fortune Financial Services, Inc., 3582 Brodhead Suite 202, Monaca PA 15061 Member FINRA & SIPC. CCF Advisors, LLC and Fortune Financial Services, Inc. are separate entities.